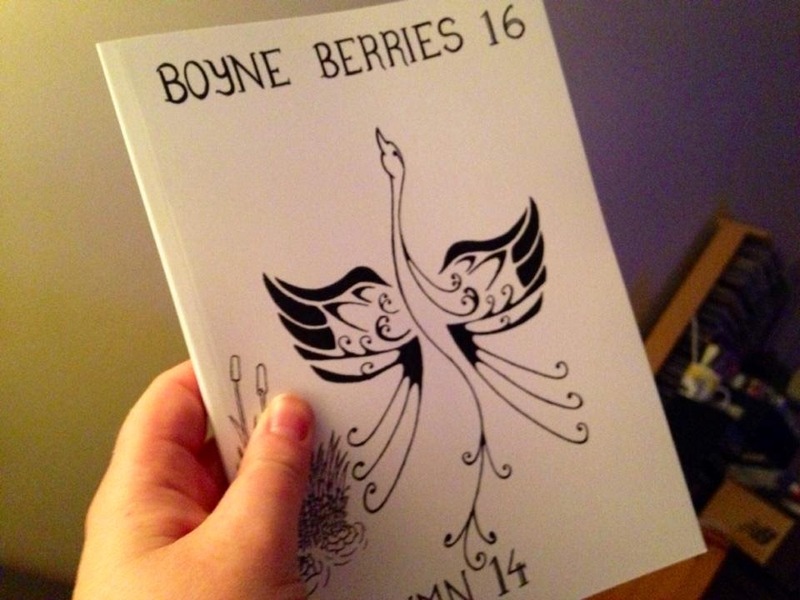 Boyne Berries 16 was launched on Thursday 25 September by former editor, Michael Farry, who complimented the new editor, Orla Fay, on her first issue. 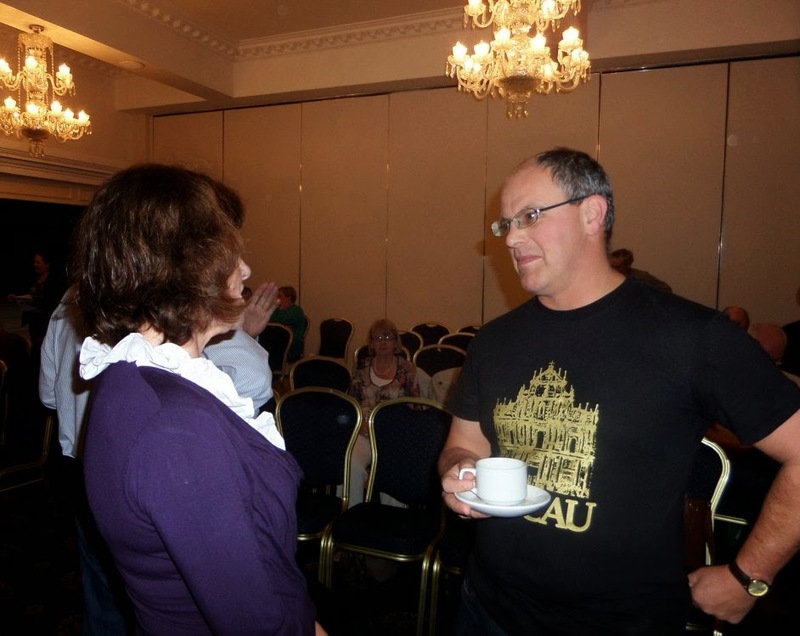 The launch took place in the Castle Arch Hotel, Trim and a large crowd attended. 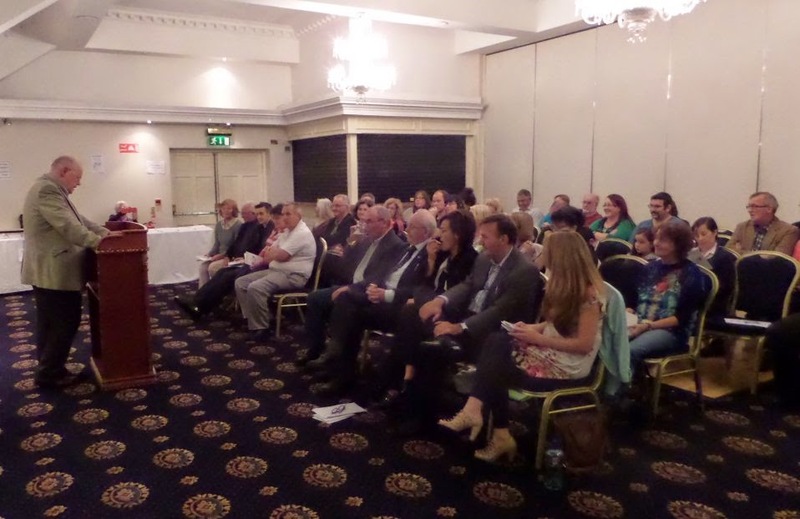 Contributors attended from many parts of Ireland, including, Carlow, Cork and Galway and read their contributions. 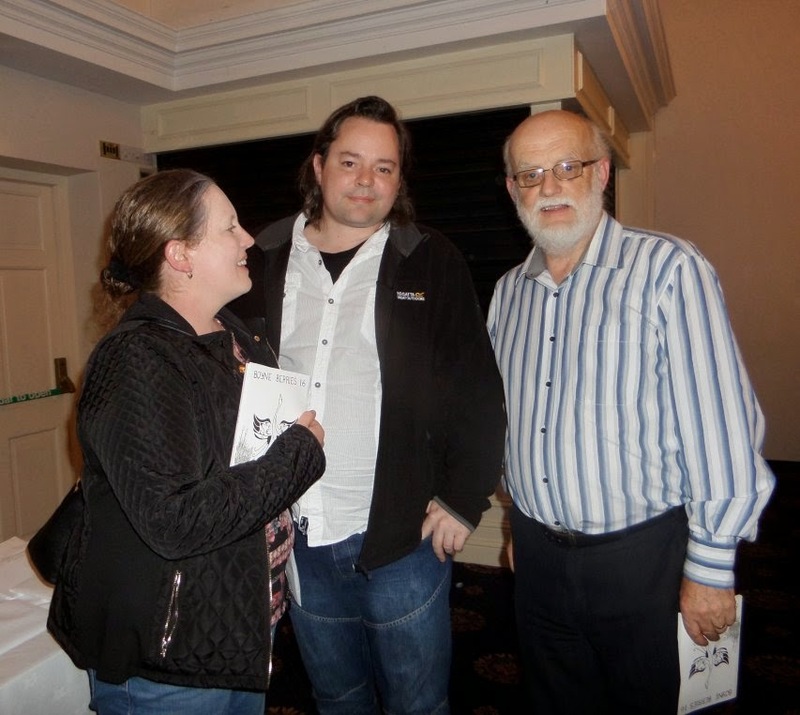 Boyne Writers chairman, Paddy Smith, welcomed everyone and complimented Orla on the magazine, and Rory O'Sullivan, the cover artist. Copies of the magazine are on sale in Trim in Antonia's Bookshop and in Spar, Market St. You can also purchase copies on the website. The launch of Boyne Berries 16 takes place in the Castle Arch Hotel, Trim on Thursday 25 September at 8pm. 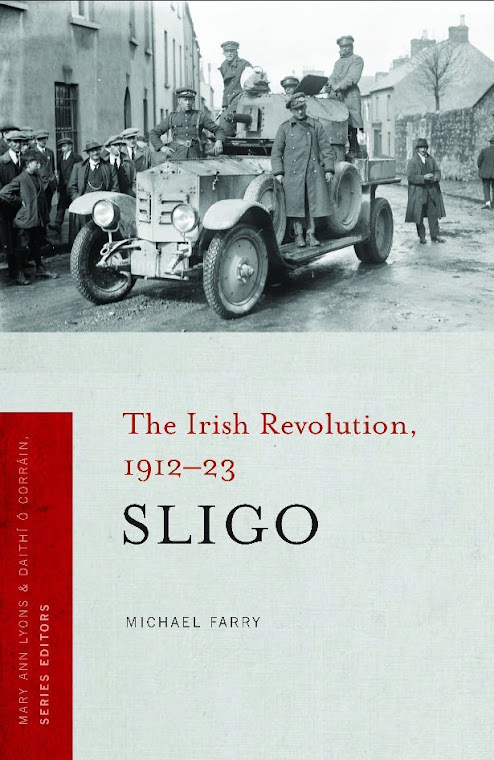 This is the first issue edited by Orla Fay of the Boyne Writers Group. 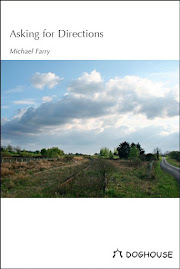 The previous editor, Michael Farry (that's me!!) will launch the issue with some wise words. Many of those featured in the issue will be present and will read. All welcome, free admission, Boyne Berries 16 for sale at a special price, tea and coffee as well. Regime Books, Perth, WA, is publishing an anthology of short horror stories, Dire Bites, and has issued a call for submissions. They want stories crawling with unease. "A truly original, suspenseful and frightening horror story is a great find. It takes a certain something to make someone shiver with dread and read to the end — a certain something that never leaves a reader, and entices them to push the tale onto friends. Don’t think of the gory stories you spun as a child, no pools of blood or knives in the hand of every stranger. We want the reason you can’t look in a mirror when the lights are dim. The real reason you hate children. The reason tripping in the dark puts a cold pit in your stomach — and a real crick in your neck. What your mind taunts you with when you're alone is excellent fodder for putting the fear into others." Word limit is anything less than 3500 words. Deadline is 12 October 2014. Along with your submission please include your own greatest personal fear to be added to your name should your submission be successful. Info and questions: jenn@regimebooks.com.au More details and submission manager on the website. These are all on the western edge of Cumbria and the first isn't a church but is a Quaker meeting house. This is Brigflatts Quaker Meeting House between Kendal and Sedberg. Built in 1675, it is the oldest meeting house in the North of England and has retained its lime-washed stone walls much of its original oak interior woodwork, panelling, columns and balustrading. The outside of the building is being repaired and was covered by scaffolding the day I visited. The building was open but there was no-one else around. There are books for sale, plenty of information leaflets and notices, tea and coffee making facilities, a library with a DVD player with Brigflatts related material for visitors to watch and a small display of materials relating to the poet, Basil Bunting (1900-1985). Bunting's most famous poem is "Briggflatts" (there is some variation in the spelling) and he is buried in the Quaker graveyard near the meeting house. Brigflatts on "Visit Cumbria". It is a most peaceful place, a must-see if you are in the area. Just east of the M6 near Carlisle is the only church in Cumbria designed by the famous Victorian Catholic convert, the architect, designer and artist, Augustus Pugin. This is the small church of Our Lady & St Wilfrid at Warwick Bridge, a lovely example of Pugin's Gothic Revival style. It is still in use as a church in Our Lady of Eden Catholic parish, Carlisle and I was delighted to attend Mass there on the Saturday evening. Beautifully decorated, the whole space is full of colour and light. Miraculously the church still has the original rood screen. Many of these were removed after Vatican II. I was also delighted to see the young priest celebrant use the original high pulpit. It also has a stained glass window to Saint Oliver Plunkett. The Anglican church, St Martin’s, in Brampton also east of Carlisle, consecrated in 1878, contains a beautiful set of stained glass windows designed by Edward Burne-Jones, and executed in the William Morris studio. Burne-Jones (1833 – 1898) was a British Pre-Raphaelite artist and designer. On the beautiful sunny day of my visit the windows were showing themselves off, the whole church was ablaze with colour. This is the only church built by the architect Philip Webb and he deliberately gave the building a fortress-like appearance to reflect its position near the troubled border region. 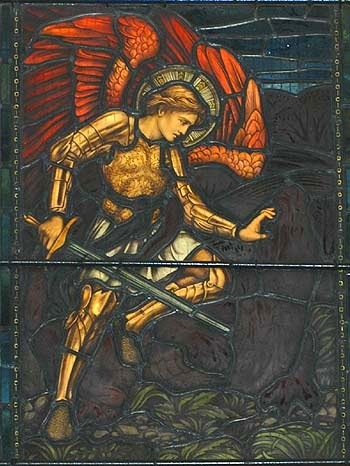 After World War I one of the chapels was dedicated as a memorial to those who had fallen and two windows, one to Saint Michael (left), were added, not by Burne-Jones. The church on Visit Cumbria. And then there was Carlisle Cathedral and the church at Grasmere and of course the stone circles - I wonder if they count as places of worship? Meath County Council Arts Office has announced the return of the wonderful Mary Lavin Season 2014. 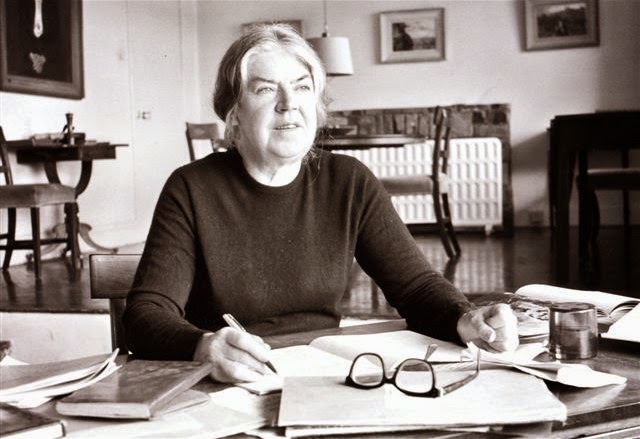 As part of this year’s programme the acclaimed Two Chairs Theatre Company is touring the much loved Mary Lavin book of short stories, "A Patriot Son". Actor Nuala Hayes will bring the stories to life while accompanied on the harp by Anne Marie O’Farrell. On the Sunday morning I visited Wordsworth House, a Georgian townhouse, in the Cumbrian town of Cockermouth, which was the birthplace and childhood home of William and his sister Dorothy. The family lived here in middle-class comfort while John Wordsworth, William's father, worked as legal representative of James Lowther, the Earl of Lonsdale. 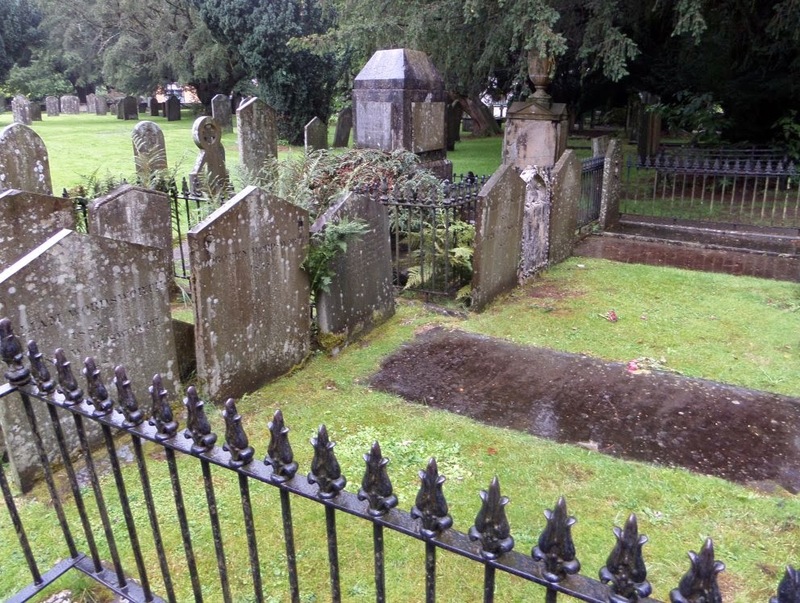 William had a happy childhood here until his mother died in 1778 and his father in 1783 and the children were dispersed, William went to Hawkshead Grammar School and lived with a local family, Dorothy went to live with relatives in Yorkshire. The house was lived in by many other families but finally it came into the ownership of the National Trust who restored it as a late 18th-century family home. I was very impressed by the house. I used an audio guide which gave just the right amount of information. There were also a number of knowledgeable guides on the premises including a costumed kitchen maid. The Georgian kitchen was especially interesting - no electricity or running water in Wordsworth's time but all sorts of gadgets none the less. The kitchen maid gave a talk on life in such a house in Wordsworth's time which was enjoyable and informative. I loved the way the garden has been maintained/restored. It is packed with 18th-century vegetables, fruit, herbs and flowers, and the River Derwent runs along at the bottom of the garden. It also has a poem tree where people can write poems and hang them on the branches. A delightful place to visit and take in what life was like towards the end of the 17th century, well worth a visit. I was disappointed when I visited the Wordsworth School at Hawkshead, it was closed for lunch and I couldn't wait until it opened. If I had checked the website I would have seen the opening hours. The village of Hawkshead is one of the most scenic in the area and has a very interesting church. The Wordsworths moved from Dove Cottage in 1808 and lived in Allan Bank in Grasmere for two years. 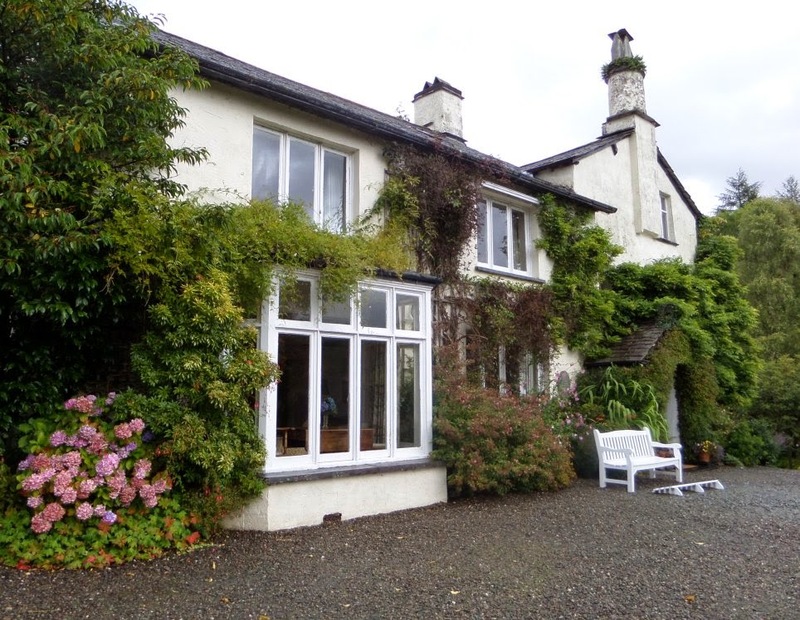 Then they moved to the Old Rectory in the centre of Grasmere where they stayed until 1813 when they moved to Rydal Mount, a large house between Ambleside and Grasmere which has a large garden and fine views of Lake Windermere, Rydal Water and the surrounding fells. This was Wordsworth's family home until his death in 1850 at the age of 80. Rydal Mount is still lived in by descendants of Wordsworth but is open to the public. It's a great contrast to the narrow spaces of Dove Cottage and judging by numbers on my visits is not as popular as a tourist stop. I found it fascinating, lots of the furniture, pictures and fittings which Wordsworth would have used are still there. There are very good guides to all the rooms and a friendly guide available to answer questions and show you around if you wish. 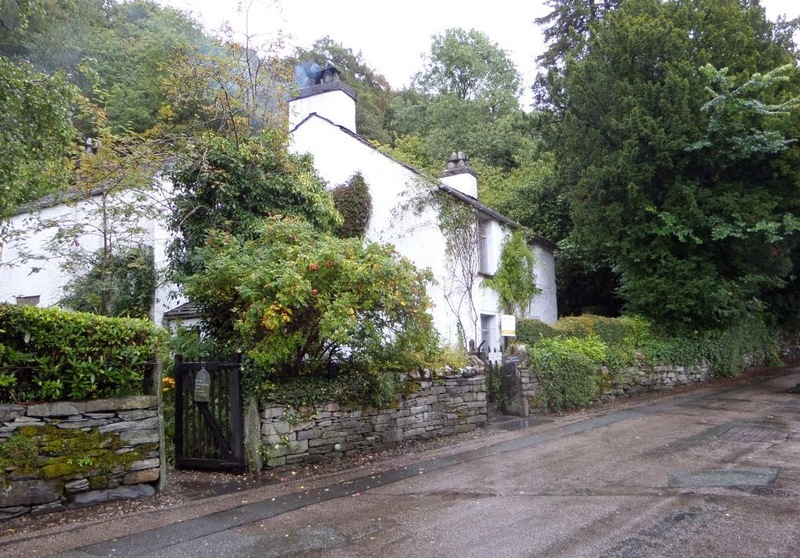 Dove Cottage has the official notification of Wordsworth being appointed Poet Laureate in 1843, Rydal has Wordsworth's original letter refusing the post. He later accepted on being assured he would not be required to write anything. He is the only Poet Laureate not to have written "official poetry" while holding the office. While Dove Cottage is the more atmospheric house and more in tune with our image of the abode of a Romantic poet I like the idea of the great poet being comfortable in the larger dwelling for most of his life. Wordsworth stands out among the English Romantic poets, he lived a long uneventful later life unlike Keats, Shelley, Byron, he wasn't addicted to opium as were his fellow writers and friends, Coleridge and De Quincey. He didn't even smoke, I learned in Rydal Mount! 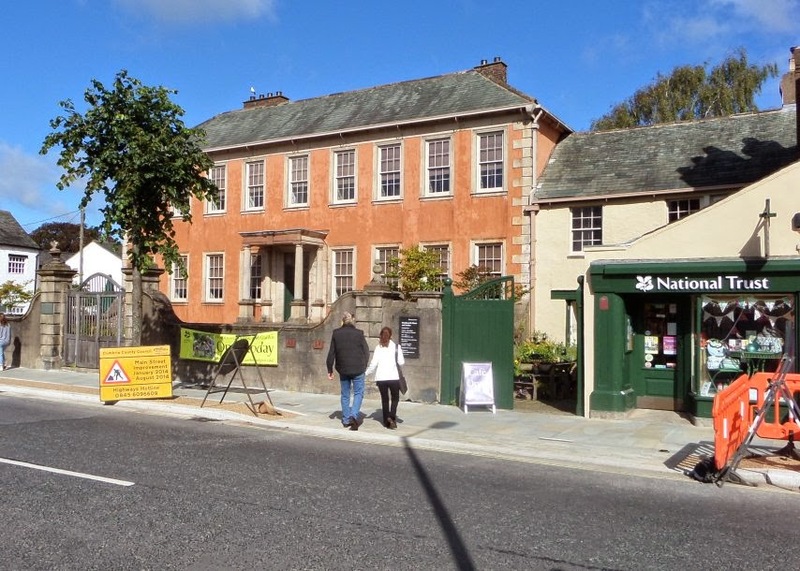 Cumbria, the birthplace of poet William Wordsworth, has a number of "must see" buildings associated with the poet. First among these is Dove Cottage, Grasmere, where the poet, his wife Mary and his sister Dorothy lived. William and Dorothy moved in in 1799, he married Mary in 1802 and three of their five children were born there. In 1808 they moved to a larger house nearby, Allan Bank. While living in Dove Cottage William wrote some of the greatest poetry in the English language and Dorothy kept her famous 'Grasmere Journal'. Museum. Dove Cottage is now owned by the Wordsworth Trust. They also own a complex of building around the cottage, the ticket office and shop, the Wordsworth Museum, the Jerwood Centre which holds the Wordsworth manuscripts, books and paintings not on show in the museum, a teashop, some function rooms. I enjoyed my visit greatly. Guidebooks stress how small the cottage is but I was surprised how spacious it actually was. Irish railway cottages were smaller! It is dark inside and you can see why three adults and three children would have needed a larger place. Because the cottage is small groups of about 12 are taken around in turns through the rooms by a guide. I have a dread of guides who assume you know nothing and go on and on. This was not the case. The guide concentrated on describing the house, telling us the use of each room, which details were original and which were not. The small garden at the back is well kept but not over elaborate and the museum is full of material and information. The museum also hosts special exhibitions. The current exhibition is "Wordsworth and Basho: Walking Poets" and contained manuscripts and early printed editions of work written by Bashō, William Wordsworth, and Wordsworth’s sister Dorothy. 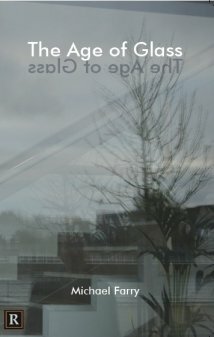 It also features new works by contemporary artists working in a wide range of media in response. The shop was small and tasteful - I couldn't find any sticks of Wordsworth rock but there were plenty of books and some daffodil mugs. The tea shop was spacious and the staff friendly and the Cumberland teacake very tasty. A local writers' group, Dove Cottage Poets, meet every month at the Cottage for a workshop facilitated by the current poet in residence and visitors are welcome. I timed my visit to coincide and I joined in. The Poet in Residence for 2014 is Zaffar Kunial whose pamphlet is being issued by Faber and Faber as No. 11 in their New Poets series. I really enjoyed the workshop, great to see how other groups conduct themselves. For the first half Zaffar shared poems on the theme of "The Edge" The fact that Zaffar's first three "sample" poems were by Irish poets caused some amusement and I was asked to read the first, Heaney's "Terminus". I put on my best Irish accent! The others were by Mahon and Muldoon. The second half consisted of workshopping participants' poems. I hadn't thought of bringing something. Some great material from the participants. A variety of themes and treatments. I was impressed. 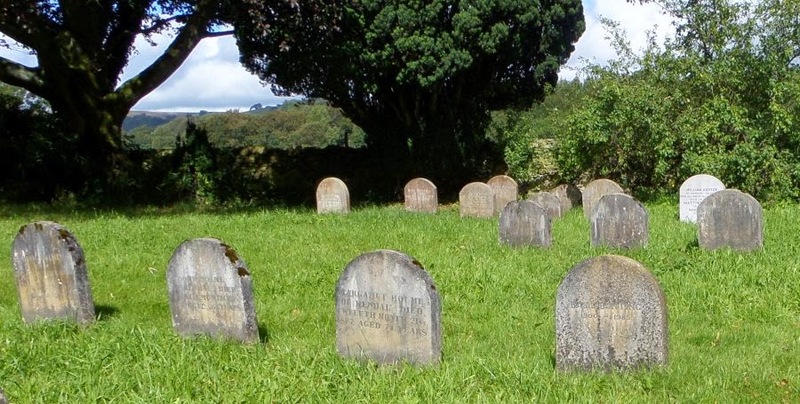 Not far from the cottage complex is the main part of the town of Grasmere which includes the churchyard where William, Mary, Dorothy and other members of the family are buried. The church itself is worth a visit and it has a memorial to Wordsworth. Just home from a great week in Cumbria. I took the ferry to Holyhead and drove there. The weather was reasonably good, heavy rain only on one day, and the roads and towns were not crowded. 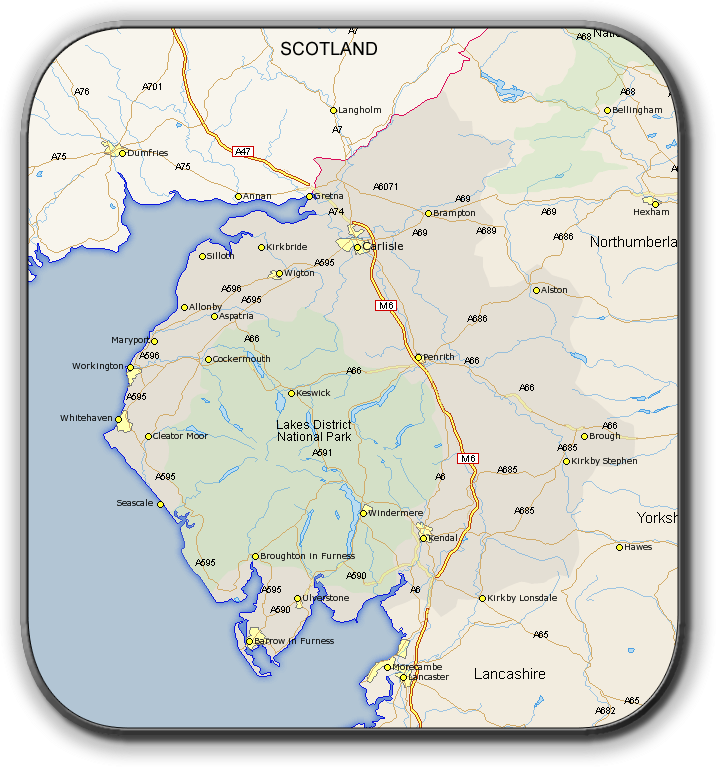 I prebooked two places to stay both near the M6, one in the south of Cumbria, one in the north, both reasonably priced. In the south I stayed at Days Inn, Kendal, Killington Lake at a motorway services area. This was good, beside an old reservoir which had swans, ducks and boats. Lots of swallows around, there had a nest just outside my window. The room was spacious, clean and comfortable. The WiFi internet access was excellent. It was close to the town of Kendal on one side and Sedbergh on the other. Sedbergh is actually in Cumbria but is in the Yorkshire Dales National Park. It regards itself as England's Booktown but it doesn't compare with Hay-on-Wye in Wales. I did find one exceptionally good bookshop in Sedbergh and spent a pleasant morning there. In the north I stayed at Crossroads House Bed and Breakfast just off the M6 close to Carlisle. A most welcoming place with great advice on what to do and see locally. The house even has a Roman well in the hallway! I stayed three days, using it as a base for the north Cumbria area, Carlisle and north east to Hardian's Wall. A great breakfast, full English (without the beans, please) including Cumberland sausage, yum! Excellent WiFi here as well. The 2014/15 Poetry Business Book and Pamphlet Competition has been launched.This year's judge is former American Poet Laureate Billy Collins. Entries must be sent no later than last post on the 28 November 2014, or online by midnight on 1 December. The 29th annual international Poetry Business Book and Pamphlet Competition invites entrants to submit a collection of 20-24 pages of poems for the chance to win publication by smith|doorstop, a share of £2,000 and other prizes. Four first-stage winners are selected and given the opportunity to submit a full-length manuscript to the second round of the competition, in which one of them can win book publication. The three first-stage winners will then receive pamphlet publication. All four winners will receive an equal share of the £2,000 prize money, and will have a launch reading organised by The Poetry Business and a selection of their poems published in The North magazine. Full price entry costs £25. Subscribers to The North, Friends of The Poetry Business, and members of the Poetry Society are eligible for the discounted fee of £20.